US 50 to Stateline Rd, L on Lakeview to L on Ferngrove Crt. 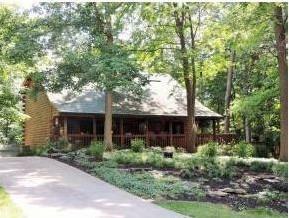 Private Log Home created for entertaining & enjoying a relaxing lifestyle. This home offers a loft overlooking a 2 story LR w/beamed ceiling, 1st flr MBR, updated kitchen & Lg Dining area. The walkout LL features an Office w/bay window, FR, game room & laundry. Exterior has endless covered porches, huge 28x20 deck, gazebo & fire pit. 2 Wooded lots! NOTE: This property was sold on 2/6/2017 and is no longer available. The details listed below are believed accurate to the date of the sale and are subject to change.